This ALR "discussion" / thread hijacking is a net positive for the geocaching community, right? I'm going to give you the benefit of the doubt on this one, since I know you're intelligent enough to figure it out. Though if you want to have a big debate about whether or not a Challenge Cache parameter is equal to or not equal to an ALR, with all due respect (I mean that), start up another thread or e-mail CacheDrone directly. 81 Proof was reviewed, published and logged by people. Your ALR language above is more general than this one cache and it should be it's own free standing topic. I will sit on the sidelines for a while and try not to distract. Ok, explain how this is specific to 81 Proof, and not a generalized comment about the definition of an ALR. Virtual and earth caches also have ALR's and that as well has been grandfathered by Groundspeak. A personal choice to not see the additional logging requirements does not mean they are not still additional logging requirements to the basic requirement of sign the log and get your smiley. With this diatribe going on (and the one before it), where does one go for information about completing this specific challenge, and which caches qualify, which caches had their D/T changed since 81 Proof was published, etc. And yes, I agree that CacheDrone could ALSO be encouraged to take the generalized ALR vs Challenge Cache generalization to another thread. Perhaps start one and post a link to it here so this one can go back to being specific about 81 Proof. Unless, of course, someone already has an agenda to work some logic/loophole/language to have a challenge cache they don't qualify for archived for some twisted sense of self purpose. ( Those I am referring to know who they are, no need to post quick links to the forum guidelines as I'm not directing that to any particular individual ). I've already asked once, Keith Watson and nothernpenguin, do not post further to this thread, effectively, I am booting both of you out, further posting will result in a forum suspention. Do not email me or PM me regarding this as it is not open for further discussion. Thank you, there is also not to be further discussion in this regard as these two posters cannot respond. This thread is to return to the intended topic of the cache and not a challenge/ALR debate. well, now that they can't respond.. I like Tequila 81 Proof - when is the 162 Proof coming out? Has it fermented long enough? Tequila: Make Mine A Double is not in the works. There are plenty of other double fizzies in existence for cachers to find. Tequila:81 Proof was the first challenge cache in Canada, to the best of my knowledge. It was fun working with Cache Drone and Brook22 to develop and name. And it was even more fun to watch yourself and psycocyclist message each other, via weekend logs, over the summer and ultimately log a joint FTF. Shortly I will update the "Changed Ratings" list. The cache container is in good shape and I look forward to some fun and interesting logs from this years finders. Tequila:81 Proof was the first challenge cache in Canada, to the best of my knowledge. Say something like that and you just know some smart a** is going to come along and refute it... and here I am! Saskatchewan's first challenge cache was published Mar. 31/08 Numeric Conundrum . Two more challenges were published there on the same day as Tequila:81 proof. I stand happily corrected. And I look forward to meeting you when you come to log My cache. Saskatchewan's first challenge cache was published Mar. 31/08 Numeric Conundrum . Corrected the link for you. Congratulations to chris-mouse on completing the requirements for Tequila:81 Proof. Another great log and what sounds like an awesome adventure with the BFL Team. Shortly I will update the "Changed Ratings" list. Yes I'm risking a forum suspension for this but frankly I'll risk it, as I really want to say congrats to Chris-Mouse, since I shared a lot of that journey with him. Thanks. I had a ball getting all the caches I needed for this. I had to skip over a lot of the memories because there simply isn't enough room in the log for anything more. I even added an additional challenge to the cache. I rode Geocycle to the cache, covering 84km in just under four hours. Still looking for this. I have 22 left to go (or more, depending on what this list has to say). All of the above caches have been brought to my attention by one or more cachers who were considering them for part of their T81 grid and noticed the change. My thanks to them for their diligence. It is my strong recommendation that you not use one of these caches for your grid. It will make your tracking more complex. This is a recommendation only. You are free to use them at the above rating. For any cache owner following this thread: If you change the rating on one of your caches, placed before April 8, 2008, I am sure all cachers would appreciate you posting a note here advising of the change. Thank you in advance for your consideration. Finally, I think I have all of the above correct. However, fingers and eyes being what they are, there could be an error. If you notice an error please either post a note here or send me an email. Thanks in advance. Sounds like this gets pretty complicated and almost impossible for someone to know when a rating of a cache has changed and could easily lead to someone thinking that they have qualified when they in fact really haven't which I understand has happened in once instance already. Since 2 of my caches have been identified, because of the location of my Silver Peek cache the difficulty changes seasonably, being more difficult in the winter months obviously and the cache has changed slightly too from when it was originally placed. Depending on when you find the cache, it would potentially have different ratings, although most people find it in the more pleasant months. My other cache Crooked Creek has also had several rating changes as the hide location has changed considerably from when I first placed it 10 years ago as even I have trouble finding it each time I visit it. It is good to see responsible cache owners out there who maintain their caches and cache pages to keep them up to date. I know I have several more caches where I have updated the cache pages accordingly, but I don't keep track of this and I have seen other cache owners do the same. Not complicated at all; every cache with variance shall be documented within this thread for the purposes of this challenge. Can I get a ruling on GCYTYV Shoe Inn? It was D5.0/T1.0 when I logged it, but before it got archived (from the trees being chopped down) the CO changed the terrain to 1.5 (as it was not wheelchair accessible). Woo! Congratulations my friend Carless, unite! May I request a ruling on GC1207H Bridges of Strathroy - multi which was recently changed? In all cases use the rating that existed on the day T81 was published. The Talented Mr. Bean - was a 5/1, now a 5/1.5 as it's tough in a wheelchair. Eagles Nest; Caverns Walk - was, I can't remember what it was (!) but it was changed to a 5/5 after being adopted and fixed up. Congratulations to Paul n Susan on completing T81. Thank you for another great log. It sounds like you and the kids had a lot of fun. Good to know! Are you actively working on this challenge? I bet you are far closer than I am (I'm only just over half way, but I just got started focusing on it). As actively as one without a vehicle can be working on a challenge like this. With only 18 to go the opportunities for me to find the farther-flung eligible caches are few. It has been almost two years since I have logged a qualifying cache. This challenge has its own tab on my stats page. Sadly, I am told that I will have to leave the country if I want to complete this, due to attrition of eligible caches. Meanwhile, the closest feasible one for me is Bushwacker, something I would consider trying in the winter -- it looks awesome. I have a whole bunch more I could write about this cache but I am saving it for my found log. I have not read all messages in this thread in several years; but I vaguely recall that CO has a PQ file with original DT ratings. I can provide website space for sharing this file if CO is agreeable. If that does not happen; perhaps a public BOOKMARK could be created and shared? I don't have time this weekend; but might start something like that. Has anyone already made their own list of these caches. For myself; I still need 5 caches: 4.5/4.5 and 5.0/2.5 thru 5.0/4.0; I have no idea if the ones I have really qualify or not! Using cutoff date for Original USA,CA cache; add 2.5/4.5, 3.0/5.0 and 4.5/1.0 to the list. As for people watching this thread; I believe the default is to get email for each post if you posted message yourself. You need to come back and click "Stop watching topic" for this to stop. * "c=5" for Canada or "c=2" for the US. Then flag the oldest caches that still qualify (published before April 8, 2008). Of course you'll just need to verify that caches haven't had any DTs changed, else cross-reference with that list, or find caches that DO qualify despite now having a different DT. I haven't checked the DTs available in North America that still qualify since I completed this challenge years ago. Are there any DTs that have zero matches now in Canada & USA? Aah. Hmm... I have finished the challenge. Are all the requisite finds authentic? Not for me to decide. 5/1 for an event that I would have to have taken a day off from work? Balderdash. But that was the listing, My 1.5/5 was a kayaking cache. I hiked through the frozen swamp and sat on a fallen branch to find the cache. Not how intended, but it was 1.5/5! 5/4.5? The puzzle was 5, but the hike, even in the crusty snow was 3.5 at most. CO's can assign whatever ratings they want. And some are deliberately off. I did hide a 5/1 once. Some found it by the missing spot on the maps. Okay. But then it showed up on someone's Facebook page with the solution. Archived for a few reasons. Oh, it was a 5D puzzle with a 1T terrain. And I worked hard on that! Thanks thebruce0 for the URL construction instructions. After generating a bookmark list of what I have left to find, I was pleased to discover that I won't have to leave the country to finish this one. I also encountered an eligible cache whose D was altered and I'd like to confirm its rating for the purposes of this challenge. So it's been a while since anyone posted... how are those of us still working on this challenge doing? 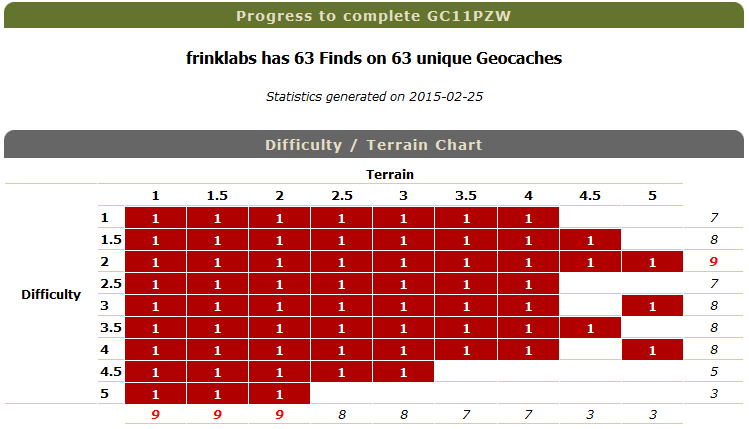 I am happy to report that I am now up to 70 of 81 qualifying caches found! It has been one whole year (almost) since the last post... lots of adventures since then! I am very excited as I am just one cache away from qualifying for Tequila 81! So amazed that I have managed to get this far. I've been trying hard to get qualifiers old enough for the California Fizzy, so I am just 3 away for that one. How is everyone else doing who is still working on this challenge? I run the checker for the fun because I love to find challenge and old geocache but I only have 46 D/T out of 81 with 983 qualifying geocache... Hum still a lot of work to do but I don't think I will ever qualify for that one.